While I’ve been knee-deep in Udacity’s CS-253 Web Development course, I’ve also been exchanging emails with Soumabha of Bytes and Banter. He, too, has been taking advantage of courses at Udacity and Coursera, so I asked him what he thought the pros and cons of these new educational systems are. Below are a few of his thoughts. One of the hottest debates raging in higher education right now regards the effectiveness of MOOCs. In case you are wondering what a MOOC is, the acronym stands for Massive Open Online Courses. These courses aim to target a global audience and generally reach them through video lectures or sharing slides and docs of their courseware. As the name implies, they are open to anyone, delivered online, and because they are free, they tend to get massive numbers of enrollees. This concept of free online, video-based instruction was started by Khan Academy but it was Sebastian Thrun and Peter Norvig’s Artificial Intelligence course offered by Udacity which amassed a whooping 160,000 students that brought the word MOOC to the world. Then came the Stanford initiative, Coursera, along with MIT’s edX and now there are many more developing sites increasing by the day, while the early leaders add more courses and schools to their offerings regularly. But enough about the history; let us come to the main question – Will this technology actually change the face of education? MOOCs have the potential to actually meet a person’s quest for knowledge, transforming what might only have been a dream to a reality. While some MOOC sites are better than others, the ‘big three’ – Coursera, Udacity and edX have already impacted a million lives by making available to the masses the video lectures of professors from Stanford, Princeton, The Wharton School, MIT and many others. I for one, coming from a middle-class Indian background, got exposure to wonderful subjects and it has changed my perspective a great deal. MOOCs also enable students to participate in discussions with a wide variety of others with different backgrounds, tastes and from different cultures. Friendships are formed, and these new ‘classmates’ can provide that extra push you might need to keep progressing in a course. The MOOC services encourage collaboration and connection-making, as can be seen with the recent addition of the Google+ hangout feature in the course webpages. One feature which is very useful for working people is the ability to watch and do exercises at their own sweet will. Udacity’s courses are self-paced, which enables a wide range of people to join and helps the office-goers to manage time in office and get quality education delivered right at their doorstep. 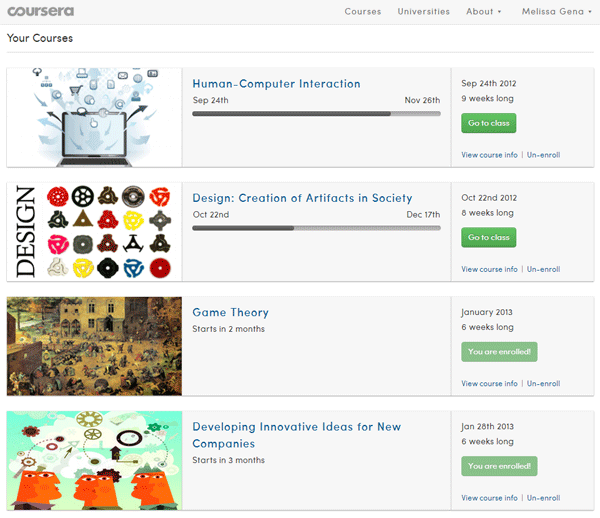 Thus far, Coursera’s courses are offered only at specific times and students move through the material as a huge cohort. In time, perhaps their courses will run all the time, too. As with any technology, there is never such a thing as all good and no bad, and MOOCs also have a downside, the most famous being plagiarism. I once searched for course reviews and to my horror I landed on a site where course questions and answers were publicly discussed in a particular forum. Many people post code for Computer Science courses in their ideone / github account and often forget to keep it private. This just invites the cheaters to use the working code and pass it on as their own. Many students have complained about the lack of security and awareness which leads to plagiarism. The value of the certificates students receive is also a big concern. While these courses are often the same courses offered at their brick and mortar schools, MOOC participants receive no college credit, and instead get a certificate of completion. When my friend took his Algorithms by Tim Roughgarden certificate to a placement interview, he was clearly told that these online certificates would not be recognized. Hiring companies realize it could have been anyone sitting in front of the computer, so the MOOC websites are finding it really difficult to increase their certificate value in the corporate world. Finally, will MOOCs actually replace the in-school and the hands on teaching approach? Well that is debatable. There are many advantages of the MOOC system but the feeling of studying in a small class of 40 is something entirely different and maybe even irreplaceable. The special attention of a teacher, a structured 6-month timeline with written exams and the individual monitoring of not only subject-wise knowledge but also the behavioral aspects of a student work are quite essential. Although MOOC services have a long way to go, nevertheless it is a huge step taken to bring education to every house (or at least the ones which have a computer inside). The development in this field can only result in some good and as the hurdles are crossed, this new way of teaching will continually improve. I decided recently to brush up on my coding skills, because I haven’t really exercised them in a while, so I took the opportunity to try a course at Udacity to kill two birds with one stone. I’ve been using Coursera for a few months now, and I was curious to see how Udacity compared – and Udacity had a CS101 course I could take immediately. I don’t really need a CS101 course in general, because I was a programmer for a handful of years, but this course is taught using Python, which I have little experience with, so I decided to really go back to basics in order to pick up a new language. The biggest difference between Coursera and Udacity is that Udacity’s courses use rolling enrollment, which means you can start anytime you like. That’s a big plus over Coursera, where you have many more choices for courses, but often have to wait months for your course to begin. 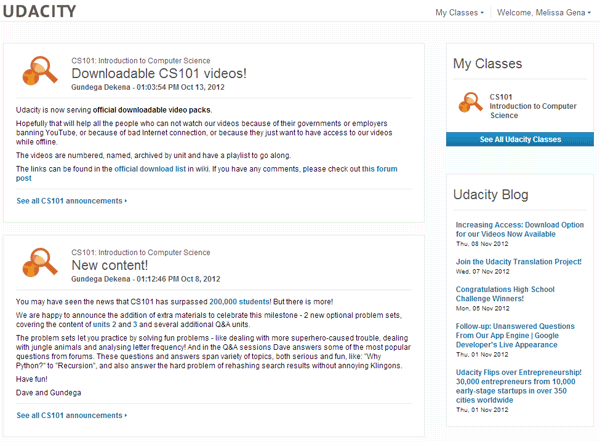 I have no idea if Coursera intends to offer its courses this way in the future, but I think they should. The power of these platforms is only amplified when anyone can start any course at any time. Another fairly striking difference can be found in the content of the home page when you load each site. At Udacity, when I go to the home page and am logged in, I see a list of announcements for the courses I am enrolled in, and there is a small widget in the upper right corner with a link to my courses. Because Udacity leaves its courses open, they offer the opportunity to continue to engage, even after you’ve completed the course. New content in the form of problem sets is added periodically, for instance. So, one of the positive aspects of the home page announcements is that they may pull me back into a course I might otherwise forget about. While I tend to like very simple, clean, straightforward designs, I would like to see something visually interesting on this screen, which I don’t, short of an icon that appears next to each announcement. Another negative aspect of their approach is that when I click on the CS101 link to enter the “classroom,” the system automatically assumes I’m starting at the beginning and begins to play the very first video lecture. The system does remember what I’ve completed already, which I can see because a green checkmark shows up next to each lecture or assignment I’ve already finished, so it’s fairly easy to scroll down to the first unfinished session and go from there – but it begs the question – if they’ve remembered where I left off, why not take me there right away? 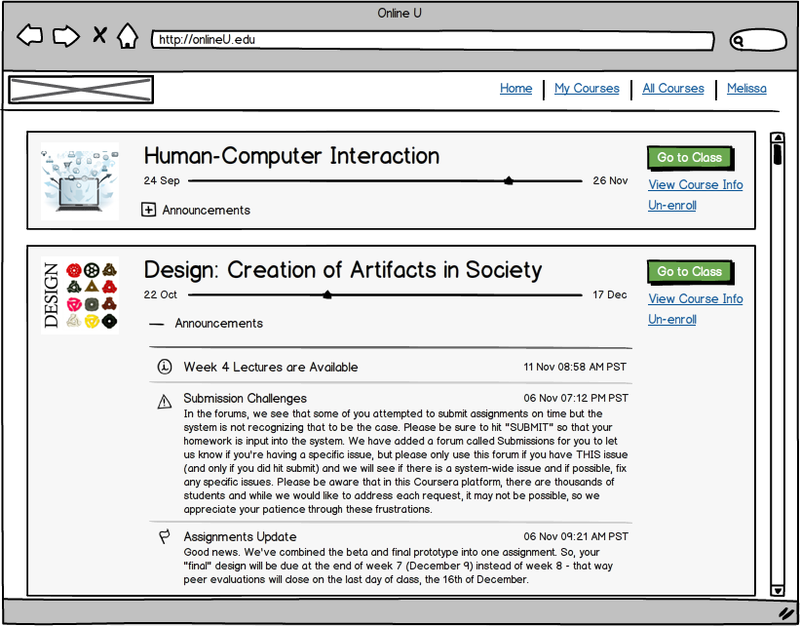 Compare these two screens, and you’ll see both companies have implemented a very “white” design, with Coursera tossing in a bit of light gray for additional contrast. I like Coursera’s approach a bit better because of that additional contrast, but think both designs are good in general. Given these two, and what I like about each of them, below is a simple mockup of a design approach that would make me happier than either individual design does. Massive Open Online Courses (MOOCs) have been in the news a lot lately, and Coursera seems to have an edge over other major competitors, at least when measured by the variety of courses currently available. See below for a quick breakdown of courses and participating institutions. I have long been a proponent of online education, and am excited to see where this industry goes, so I signed up for a Coursera course that started today. The course is Gamification, and is being taught by Kevin Werbach, Associate Professor at The Wharton School, University of Pennsylvania. I’m particularly interested in how data will be used and what the interaction dynamics will be in an environment like this. The term “Massive” is part of the name of this category of courses for a reason. Almost two weeks prior to the start of the course, Professor Werbach tweeted that he was amazed to see more than 50,000 registered students. My first impressions today are positive. After logging into the course, the information is well organized, and there are both discussion forums and wikis to encourage engagement. At a glance, it seems approximately 300 primary posts have already been made in discussion forums, with hundreds of replies. The discussion has a voting feature, which is useful and should allow us to focus on the most popular threads, which I imagine will be vital with the ridiculous volume of information that will likely be posted here over the six week span of the course. Posts can also be tagged, which makes it simple to find a collection of posts on a given topic if tagging is used well. Integration with the wiki feature could be tighter. When I navigate to one of two wiki links, I have to log in again to view the content, and have no simple way to navigate back to the course site itself. The wiki is labeled ‘Beta,’ so I imagine better integration will come with time. As far as data goes, students were asked to complete a survey answering questions about demographics and the reason for taking the course. I would love to see an analysis of that data at the close of the course, and hope there are further surveys to capture additional data points along the way. After having watched the first two video lecture segments, I’m happy with the quality of the video, and like the fact that interactivity can be built into the lectures. Occasionally, the video will pause to offer a simple quiz question, and the instructor seems to use a stylus to highlight elements on screen as he’s speaking. It’s easy to navigate directly to the next video without having to “exit” the viewer, and the site design in general is simple, clean, and easy to follow. Another interesting point to note is that in the spirit of free learning, there are no required materials to purchase to go along with the course. I’ve joined in my first discussion, and so far, everything looks good. I’ll be back with more thoughts as the course progresses. Click here for an article that discusses all three providers.